Life of Lou: A little bit of everything Slice! This weeks recipe is a new one for me and boy oh boy is it a goodie! I made this slice for the first time yesterday because I already had all the ingredients in my pantry and it looked fool proof! *It seriously is fool proof! This slice is gooey and crunchy all at once and packed full of flavour. 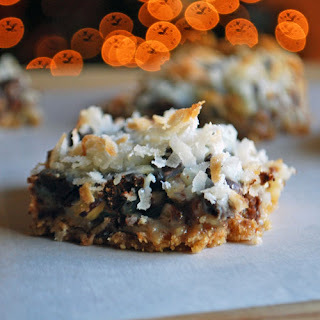 It has nuts, chocolate, biscuits and coconut - thus a little bit of everything! Cooking time included it takes approx. 30 minutes to make. It has already been labeled as my sisters 'new favourite' and has been a major win with the whole family, my grandfather included! Grease a medium sized slice tray, lining the bottom with baking paper. Combine crushed biscuits and melted butter in a small bowl, then pour into slice tray. Pressing down so it forms a thin base. Layer pecans then choc chips on top of biscuit base. Then cover with condensed milk, making sure it is spread evenly. Sprinkle coconut on top and you are ready to bake it! Bake in moderate over for 2--30 minutes, until coconut is golden brown.